Playyoo, a social networking platform for creating and sharing mobile casual games, officially opens its beta doors to the public today. 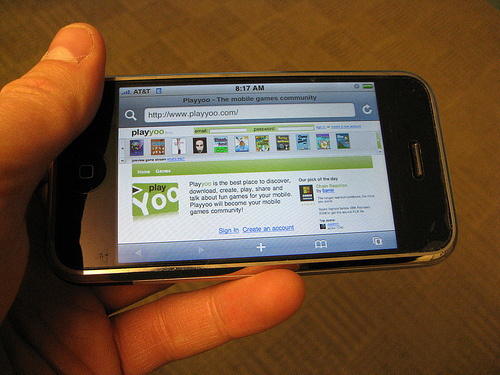 Described by TechCrunch as the "YouTube For Mobile Games," Playyoo (www.playyoo.com or m.playyoo.com on mobile phones) allows anyone to create and submit mobile games to its network. Users can create, share and discover new mobile experiences all via Playyoo. Playyoo, a privately held company based in London, England, offers game developers a place to create and distribute Adobe Flash Lite mobile games. But you don't have to be a seasoned game developer to create a Playyoo game as it offers integrated game creator tools to enable anyone to develop and publish a mobile game creation. Unfortunately, since the Apple iPhone does not offer an open platform to enable me to add additional games, Playyoo will not work for me but don't let it stop you from giving it a try. Playyoo offers a number of gaming options ranging from simple Tic Tac Toe to more difficult games like Yatzy. Though I was unable to create and test a game of my own I like the fact that Playyoo is trying to low the barriers of entry for anyone interested in creating a mobile game. In addition to Playyoo's public beta launch they are also sponsoring a Flash Lite developer contest with $25,000 in prizes that runs until February 28, 2008. If you are interested in participating visit the Playyoo contest details.